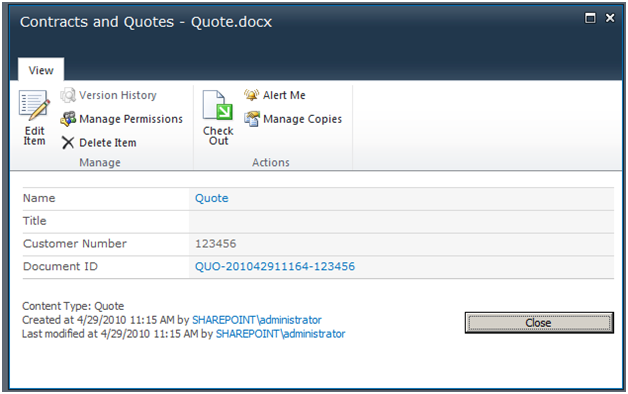 SharePoint 2010 introduces the Unique Document ID feature, that assigns an unique ID to each document uploaded in the site collection. As said, the scope is site collection, so the document cannot be found outside the site collection using this service. Out-of-the-box, SharePoint uses its own provider to assign document ID’s. But what if you want to influence the way the unique ID’s are generated? Well, fortunately, SharePoint 2010 also offers the possibility to create your own provider. In this article though, I would like to take it one step further and make the generation of the ID’s dependant on the list item itself. I will use the content type in this example, but you can use any field of the list item you desire. Then it should contain the customer number, consisting of 6 digits, obtained from the document properties. If the document does not contain a customer number field, or it is empty, we use 000000 as the customer number. Before we can create a provider based on content types and fields, we first need to define our content type and the customer number field. Right click your project, select add new item and select Content Type in the template window. Name your content type Contract and derive it from Document. Repeat these steps for the Quote content type. Now that we have our content types and fields, we can continue with the custom document id provider. Let us start by creating a new empty SharePoint project in Visual Studio 2010. Once done, create a class called DocumentIdCache and include the code listed above for the cache object. Secondly, add a class called CustomIdProvider. Let the class inherit from the DocumentIdProvider in the Microsoft.Office.DocumentManagement namespace. For this, add a reference to the Microsoft.Office.DocumentManagement assembly that is located on the .NET tab. In the DoCustomSearchBeforeDefaultSearch property, make sure in returns false. 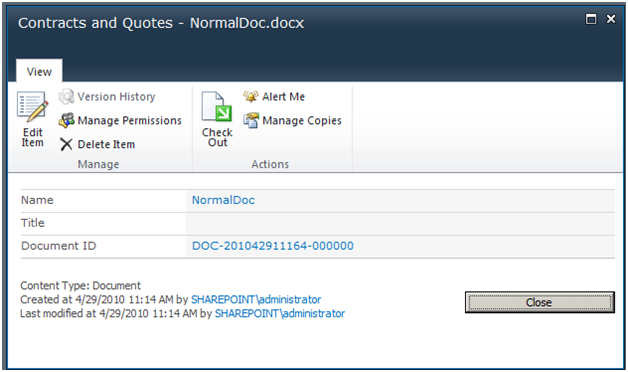 This will instruct SharePoint to use the default search method to find the document. Creating a custom loop method is beyond the scope of the blog, but if you have a better way of finding the document, you can do so in the GetDocumentUrlsById method. In the GetSampleDocumentIdText method, make sure it returns a string that resembles the pattern you will return for your id’s, for example CTR-20100422153421-123456. The GetDocumentUrlsById method contains our logic to find documents other than search. Because we use the standard search method, we return a new empty string. We first check whether our list item contains a field called CustomerNumber (defined in our solution). If the list item contains the field, we check whether or not a value was entered and if so, obtain the value. We then continue to get the content type of the list item. Based on the content type’s name, we define the first part of our document id. Finally, we glue all of it together and return the identifier. Last thing we need to complete now is register the custom provider with our site collection. 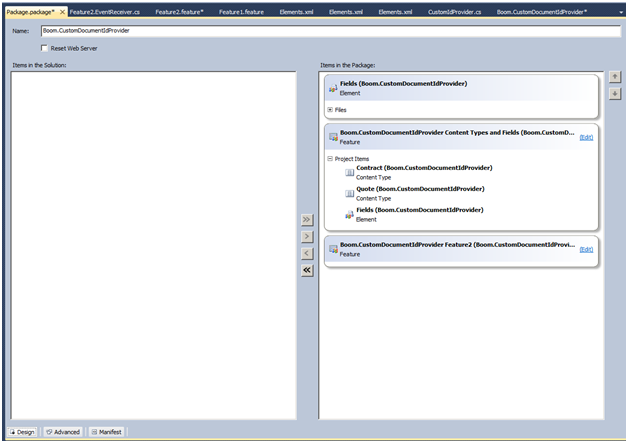 Right click the features node in the solution explorer and select Add Feature. Right click the created feature and select Add Event Receiver. We will attach the custom provider in this receiver. Implement the FeatureActivated and FeatureDeactivating events. See below code snippet. We register our provider by calling the static DocumentId.SetProvider method, passing an instance of our fresh custom Id provider. In the deactivating method, we reset the provider by using the static DocumentId.SetDefaultProvider method. Because I enabled the Document Id Service after I have created the documents, each document has the same date time stamp, because they are all processed in the same batch. But normally, this is not the case. Off course, there are some drawbacks to this implementation. For instance, if multiple normal documents were uploaded and the service was turned on at a later stage, they would have the same ID. However, the scope of this blog is just to show that you could create your own provider and that you could use properties of the document and site to generate the identifiers for the document. Most important aspect to keep in mind is that you have to ensure that the generated ID is unique within the site collection. I have uploaded the Visual Studio 2010 solution here. Good luck with creating your own! I encountered this error when I set up my fresh SharePoint 2010 farm and created the site collection before completing the configuration of the search service. I checked all my settings, but the search service was up and running and presented no errors. Still, I was not able to fire a query from code, as this exception kept popping up. After doing a search on internet, I found that the problem was not with the search service, but with the content database settings. Strange place I would say. It appears though that each content database is assigned its own indexer and because the search service was turned on after the content database had been created, no indexer was assigned to the content database. So, to correct this problem, open Central Admin, go to Manage Content Databases, select your content database and select the appropiate indexer in the properties page. Once done, the problem was gone. But with PowerShell 2.0 becoming more important to SharePoint 2010, it was time to dive a little bit into this scripting language. At my current customer, the maximum upload size for documents needed to be increased to 100 MB, from the default setting of 50 Mb. Obviously, we could do this using the Central Admin, but it becomes more of a problem when there are a lot of web applications, hence the choice for scripting. Also, a lot of other settings on different layers need to be adjusted to make this work, for example WebDAV settings in Vista and registry settings for the crawler, but this post only covers the PowerShell script to change the setting in the web application general settings. So, below is my first PowerShell script. Note that this script is by no means the best one. It could be extended with exception handling, parameters to specify action and size, but for the purpose of this post, it is clear enough. Not much exiting stuff going on here right? First I load the Microsoft.SharePoint.dll assembly by calling the LoadWithPartialName method of the System.Reflection.Assembly class. Because this method is static, we use the ‘::’ operator. Once loaded, we get the local farm by calling the SPFarm.Local method. Again, becuase Local is a static method, we use the ‘::’ operator. When done, we get all SPWebService objects within the Services collection of the Farm. This line is a little less obvious. In C#, we would use the SPFarm.Services.GetValue<SPWebService>() method. 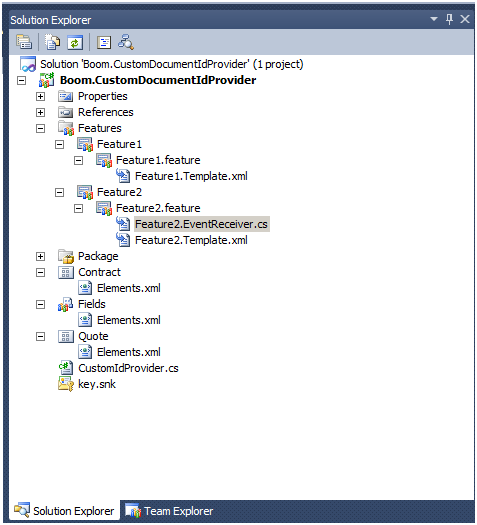 In PowerShell, we filter the Services collection by using a sort of SQL like syntax. Get all services where type (GetType()) equals (-eq) Microsoft.SharePoint.Administration.SPWebService. The rest speaks for itself and looks quite a lot like C# code. There you have it, my first PowerShell 😉 Naturally, we could create a simple command line utility that does the same using C#, but these scripts are created faster and are also easy adjustable to fit needs. So, in short, with SharePoint 2010 embracing PowerShell, we have no choice then to venture in the world of PowerShell. With Microsoft SharePoint 2010 approaching for official release on May 12th 2010 (earlier for MSDN, SA, VL licenses), businesses are already looking at how we can easily migrate to 2010. So is it just click and install? Or are any special arrangements needed? Yesterday, we tested one of our custom extension packs on the new platform (RC). There is some good news and some bad news 😉 The good news is that features contained in the WSP pack were installed without a problem. The bad news is that some of the features in the pack introduced problems when activated. Basically, all standard features, like content types, document libraries, list definitions and site definitions worked without a problem. Also the eventhandlers attached were also correctly attached in 2010. The features that did not work upon install were those that were dependant or interacted with Shared Service Provider components. As the architecture behind these are complete different in SharePoint 2010, I did not expected it to work without a fight anyway 🙂 The move to Service Applications, where the individual components of the Shared Service Provider were disconnected and isolated, caused several of my features to fail, as they could not find the Shared Service Provider. Also, some of the classes used for UserProfiles are now deprecated and replaced. Another thing I noticed was that when I created a document library from my installed doc lib definition, it would be created, but function like the 2007 version. The row selection, checkboxes and 2010 look and feel were not available, meaning that the xml definition also needs an upgrade if you fully want to utilize the 2010 functions. In short, some actions are indeed needed, before one could easily move to 2010. For standard sites though, that do not contain any drastic customizations, it is failry easy, using the content database attach method.